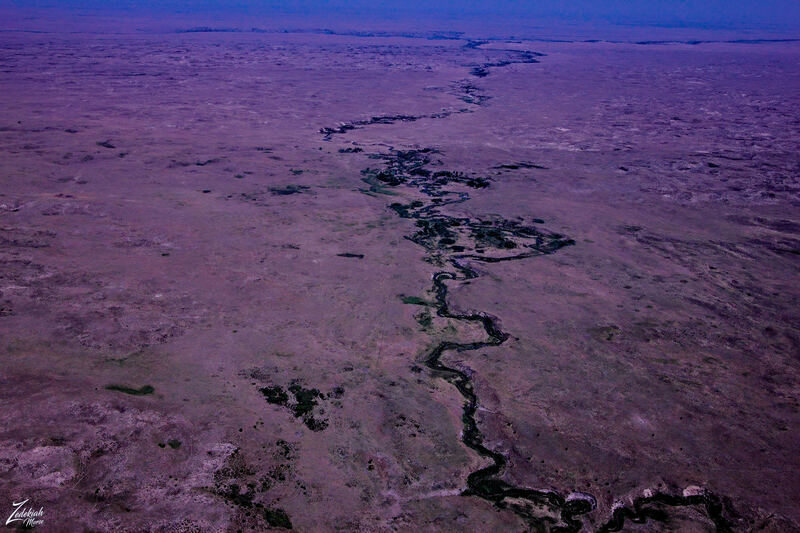 As you fly directly into the center of these vast undulating sand hills you come upon the Snake River, a 126-mile-long (203 km) tributary of the Niobrara River, which you can see in the distance along the horizon on the of this image. Entirely located within the Sandhills the river flows past the southern edge of the Samuel R. McKelvie National Forest. For thousands of years, this river was an oasis providing water and shelter to the First Nations Pawnee who lived on the south bank of the Platte River, their main village is only a few miles east of where Fremont now stands. They numbered then between 4,000 and 5,000 and interacted in a variety of ways with the rapidly increasing contact with pioneers and then settlers. Spanish and French explorers recording them as being a warlike and a large and powerful nation, the most numerous of any tribal nation west of the Missouri River. They were first heard of through the language of the Illinois Tribespeople, and the name is of that language. The tribe started appearing on early Spanish and French maps as early as 1673. It was known that they were hostile toward the Spaniards but over time seemed to have always been friendly with Americans. They established large permanent villages of earth-covered lodges, and cultivated corn, beans, and melons, frequently going off in large parties to the buffalo lands to hunt and meet their enemies in warfare. They claimed the country south to the Kansas River and north to the Platte. Pike, in 1806, estimated the population of three villages at 6,223, with two thousand warriors. They were divided into four bands – T -swa (Grand Pawnee), Tskithka Petower Kattahankies (Republican Pawnee), Tapage Pawnee and Sker Pawnee, Mahas or Loups.